A modern take on Eggs Benedict. (Maybe a little easier for some folks). Whisk eggs, milk, salt, and pepper together in a mixing bowl. Scramble them with the cooked bacon and veggie of your choice in a pan over medium heat. When the eggs reach your desired texture, remove from heat and place equal portions on top of the toasted bread. 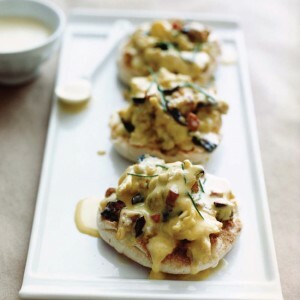 Drizzle hollandaise sauce on top and enjoy.